Ford continues to top the Canadian tables as their F-Series built on May’s successes to have its second consecutive best month in a row. Sales of Fords are up 7% on this point last year, as Ford go into the second half of 2017 on a high. 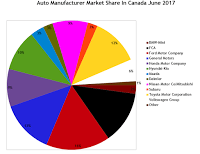 Vehicle sales remained buoyant in the Canadian market overall in June. Volkswagen Group saw an increase of over 25% on June 2016, with the Volkswagen brand and stablemate Audi both posting impressive figures. The former remains over 10% down on its annual performance compared with this time last year, but if trends continue we could see Volkswagen Group overtake itself for the first time in 2017.